“The extremely tense situation in occupied Western Sahara illustrates the need for the UN to work for the protection of the people and the natural wealth of the territory”, stated Western Sahara Resource Watch in a letter to UN Secretary General Ban Ki-Moon and all members of the Security Council today. Read the letter here. Saharawi in the occupied territory of Western Sahara recently rejected Morocco’s 35-year occupation en masse, moving from cities including El-Aaiún, Smara and Dakhla into nearby encampments. The Saharawi have done so because of dismal social and economic prospects in which they are increasingly disadvantaged and marginalized in their own land. While the Moroccan military tries to seal off the camps, the humanitarian situation of the Saharawi protesters grows ever more troubling. Several violent interventions by the Moroccan security forces have been reported, among which the fatal checkpoint shooting of the 14-year old Saharawi Nayem Elgarhi outside the camp near El-Aaiún. Morocco has denied foreign observers and the international media access to these camps. The extremely tense situation in occupied Western Sahara illustrates the need for the UN to work for the protection of both the people and the natural wealth of territory. Therefore, Western Sahara Resource Watch (WSRW), an international NGO - with member organisations in over 35 countries - with the aim of safeguarding Western Sahara’s natural resources for the Saharawi people, would like to repeat its call for the establishment of a mechanism to place the proceeds from the exploitation of Western Sahara’s natural resources under international administration until the conflict has been resolved, and for the inclusion of a human rights component into the MINURSO mandate. 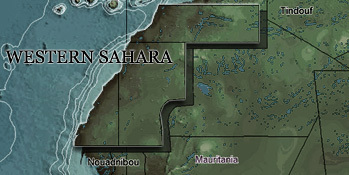 All evidence shows that the Saharawi people have not been consulted in relation to the exploitation of Western Sahara’s resources by the Moroccan authorities and complicit foreign interests, and that they do not reap any benefit from the economic undertakings in the territory. The protest camps visibly demonstrate that the two legal prerequisites for economic activities in a Non-Self Governing Territory have not been met: namely consideration of the wishes and interests of the people of that territory. On behalf of the Saharawi people, the Frente POLISARIO has protested these illegal activities in numerous letters to both the Security Council and to your Excellency. It is clear that Morocco’s continuing and illegal exploitation of the natural resources of Western Sahara continues to undermine confidence between the parties and as such is a key obstacle to the resolution of this long-standing dispute. Western Sahara Resource Watch urges the establishment of a mechanism to place the proceeds from the exploitation of the territory’s natural resources under international administration until the status of the territory has been resolved. Furthermore, the current situation once again underlines the need for the MINURSO mandate to be adapted to include a human rights monitoring capacity, with a direct reporting line to the UN Security Council. The UN has an obligation to protect the Saharawi population while they wait for the organisation of a just and equitable self-determination referendum, in conformity with the resolutions of the UN General Assembly, the UN Security Council and of the African Union. MINURSO is the only UN mission established since 1978 without a mandate to monitor human rights. The tragic death of a 14-year old Saharawi boy renders this unjustifiable. 06.02 - 2019 / 06.02 - 2019Will European Parliament back deal with world's most unfree territory?